Real Madrid won a meaningless 2-1 match (for them) in Granada, thanks to a late own goal and a penalty Cristiano Ronaldo converted. Granada players, now only two points above the relegation zone with one match left, swarmed referee Carlos Clos Gomez, with Dani Benitez actually throwing a bottle at the ref. Granada where ahead 1-0 after only 5 minutes, but Real Madrid managed to turn things around in the last nine minutes with Ronaldo’s penalty and a 90th minute own goal by David Cortes. Gomez, being from Zaragoza, who are competing with Granada for relegation, didn’t help. In the midst of all the confusion, two Granada players got sent off and Dani Benitez, who wasn’t even part of the 11 men on the pitch at that stage, hurtled a bottle at the ref, missing. In Germany, actually relegated FC Koln fans couldn’t handle the last day tragedy. The 1-4 home defeat against Bayern Munich while the news of Hertha Berlin winning against Hoffenheim was too much to take, and so came the pyrotechnics. Added with an attempted pitch invasion, the whole scene had a very war like atmosphere to it with some surreal visuals of smoke, fire and a real menacing feeling in the air. Lukas Podolski, leaving the club for a second time in his career towards bigger and better fortunes, had to be escorted by the police off the pitch, in actual fear for his safety. 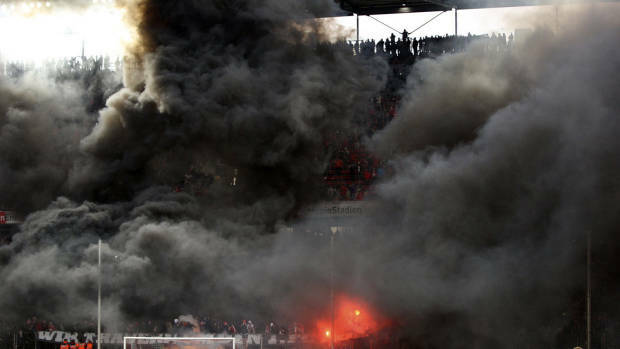 We do love flares and smoke grenades when they’re used properly and safely, but yesterday in Koln, there was a feeling that the fans were actually trying to burn the stadium down with everyone in it.